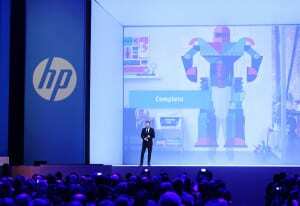 A four-story tall 3D cube replicated on stage the insides of a printer and served as a backdrop for the reveal of HP’s new printer technologies. To announce its “reinvented” lineup of printers and “Printing Reinvented” tagline, HP needed an event as big and bold as the news itself. And this past March, at Lisbon’s imposing MEO Arena, it did just that with a once-in-a-decade product launch that through 3D, hypergraphics and a novel use of video took its audience inside its new printer technologies. 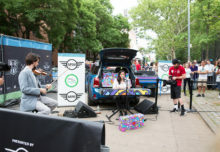 Social media, including a live Periscope feed, played a key role before, during and after the launch, which was the first major event following the spin-off last year of HP’s printing and PC business from parent company HP Enterprises. “With that news as a backdrop, and also a commitment as a marketing team to not just reinvent products, but to reinvent the way we market our product, we asked what can we do differently,” says Rob Le Bras-Brown, who was global head of print marketing and customer experience design at HP at the time, and now heads up digital experience, a newly created position at the company. The result: a four-story tall 3D cube that during the opening session of the three-day event replicated on stage the insides of a printer and served as a backdrop for the reveal of HP’s three new printer technologies—laser jet, inkjet and PageWide, a scaled-down version of its large-scale web presses used for printing magazines and bank statements. 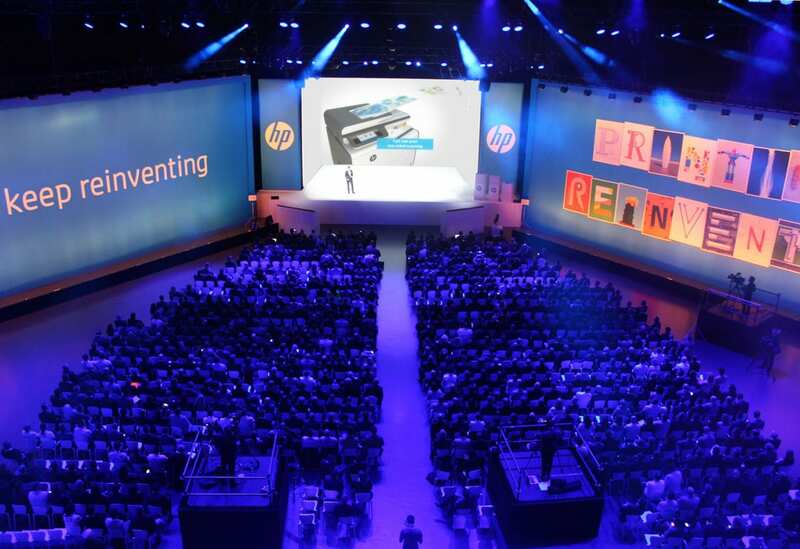 Massive hypergraphics of HP’s “Keep Reinventing” and “Printing Reinvented” taglines greeted the audience of 750 channel partners, resellers, trade press and analysts as they entered the opening session and bookended the 3D cube on the massive auditorium’s stage. The walls of the cube served as a launch pad for graphics that zoomed out with the speakers’ names and other key messaging. 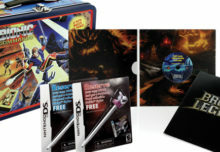 As the presenters stood inside the cube, describing the printer technology and pointing out the differences between the machines, video footage synched with the narration, zooming inside, for example, when the speaker announced, “The magic starts inside the printer,” or popping up with an ink cartridge as that technology was presented. The set-up required a bespoke set of trusses, specially made seamless screens, four high-resolution projectors and a set of animated images run by HP workstations and servers manned by an army of technicians. Following the presentation and on-stage product reveal, attendees got up close and personal with the printers, which were displayed in an adjacent area. Breakout sessions over the next two days offered training and a deeper dive into HP’s technology, security software and managed print services. The event was Periscoped from Lisbon and linked to HP BusinessNow, its small business platform, and its general corporate audience. It also appeared on Twitter, Instagram and Facebook before, during and after the event. Agency: Infinity Marketing Team, Los Angeles.